I love me some hot chocolate when the weather is chilly. At night I usually drink some hot tea or hot chocolate since it warms me up from the inside as well as satisfies my sweet tooth. I thought of mixing it up by making some strawberry hot chocolate. I always have frozen strawberries in the freezer, and white chocolate chips on hand, so it was a cinch to put together. I think this is a drink that adults as well as children would love! So make up some strawberry hot chocolate, start a fire and play some board games as a family. Doesn't that sound fun? Never miss a post! 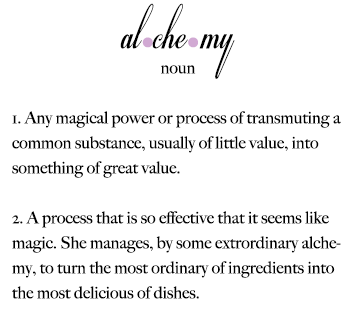 Like The Alchemist on Facebook! Vintage Mikado Teacups available at my Etsy Shop, House of Lucien. In a small saucepan add the milk, white chocolate chips and sugar. Cook it on medium high heat stirring frequently until the white chocolate is melted. Add the strawberry puree and cook until it is your desired temperature (very warm or hot.) Taste it and see if you think it needs more sugar, if so, add some, taste, adjust to your liking. Add vanilla extract if using. If you are using food coloring add a little at a time until it becomes a color you like. Note: there will be strawberry seeds in the bottom of your cup. If that bothers you, then pour it through a fine mesh strainer before serving. Pour into cups and top with whipped cream and sprinkles if desired. This sounds heavenly! Your presentation looks lovely too. Thanks for the recipe! Follow along to! I think you'd enjoy the blog! That looks delicious and lovely. What a great recipe! That is the prettiest cup of cocoa I have ever seen! I can't wait to give it a try. Thanks so much for sharing this!! That color is irresistible!!! Love the flavors in this hot chocolate!!! Ohhh this looks beautiful AND delicious!!! Love those teacups too! So pretty! Thanks for sharing! I pinned it for my husband, he loves strawberry stuff! How Pretty and so girly! Perfect for a little girls tea party, minus the tea of course. I need this now! I pinned it right away so I can remember to make it later! I found you at the Anti-Procrastination Blog Hop. I'm your newest follower:) Come say hi! AHHHHH it's pink! I just LOVE coming here and seeing what yummy things you are up to:) Thanks for coming to party with us at Whimsy Wednesday! This is such a great idea! Would love if if you linked up on my blog hop www.w-t-fab.com/search/label/bloghop. Also let me know if you'd like to follow each other! Oh my goodness...I must try this! My kids will love it! strawberry hot chocolate, OMG, this sounds delicious! Found you from over at Foodtastic Friday, looking forward to more recipes from you and definitely bookmarking this one! Hi, this looks so fun for a "tea" party! I am now a follower, thank you so much for sharing. Wow, that looks delish! I wasn't sure until I saw real strawberries and white chocolate, YES! We will have this soon. Thanks for linking up on Super Sweet Saturday. This looks sooo good..can't wait to try it. This is a lovely presentation for this awesome Hot Coco, wish I had a cup right now. Have a fabulous weekend and thank you so much for sharing with Full Plate Thursday. How pretty is that? Very! Makes me want to host a girly party. :D Thanks for sharing. Hello! Thank you for participating at SHOW-licious Craft Showcase! :) I host it every weekend so I hope you return to post more of your great things! My girls would freak out over this! So fun! Hi! This is being featured today for Whimsy Wednesday! The new party starts soon:) Beautiful recipe and pictures! I've never thought of strawberry hot chocolate before! This sounds like a heavenly drink. I'm going to file this away for when it gets really cold. Probably will skip on the colouring although the pink is very cute, but sprinkles are a must! Oh, that sounds really good!! Thank you for sharing at Sharing Saturday!! What a creative and original recipe. Your hot chocolate looks as good as I'm sure it tastes. We are gluten free at our house, and this looks like a perfect GF treat. I'd love for you to visit my Gluten-Free Monday party at OneCreativeMommy.com and link up this and any other GF idea you would like to share. I hope to see you there. Hello! I’m stopping in to invite you to join us at the Clever Chicks Blog Hop this week! The very next time I read a blog, I hope that it does not disappoint me as much as this particular one.Happy New Year Messages I mean, I know it was my choice to read, but I truly thought you would probably have something useful to say. All I hear is a bunch of crying about something that you could possibly fix if you were not too busy searching for attention.